Sadly this surname, recorded in the spellings of Hollyland, Holliland and Holyland, whilst locational, has nothing whatsoever to do with "The Holy Land", although it may still have religious antecedents. It is English, and medieval, and describes a person who either lived by a now "lost" village called possibly "Holly-laund", and probably in East Anglia, or who lived by a "holy tree" in a clearing in a forest, or possibly a hollow in the forest. 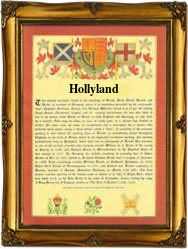 There are over one hunded area or village names in the British Isles which are prefixed with Holy or Holly or Hollow, all seems to have different meanings, ranging from the Holly tree, the holy tree, and the hollow (a hole), to a Scandanavian personal name "Holti" and the Olde English "Heald". Three changes of language in the past fifteen hundred years, plus ten times as many dialect changes, make precise definitions of locational surnames very uncertain. In addition some five thousand British and Irish surnames originate from now "lost" villages, this is almost certainly one of them. Early examples of the surname recordings taken from church register recordings include Margaret Hollylande, married to John Lute at St Michael's church, Cornhill, in 1564, and Ralph Brown, who married Ann Holliland, also in London, in the year 1605.The first recording may well be that of Thomas Hollilond, in the register of the county of Huntingdonshire, in the year 1273.